While the crew busied themselves to ensure that their ship was healthy, the S-IVB had not been idle as it prepared for its main burn. Throughout the one-and-a-half orbits made before TLI, a set of small rocket thrusters attached around its base kept the stack pointed forward into the direction of travel. The vehicle was still in the upper fringes of Earth's atmosphere and this sharp-end-forward attitude presented the smallest area to the hypersonic air flow, minimising frictional heating. They also kept the cabin windows facing Earth and the spacecraft optics on the opposite side facing out to the stars for the CMP's navigational duties. As the sharp-end-forward attitude was also required for TLI, maintaining it throughout the Earth-orbit phase avoided having to make a large adjustment just prior to the burn that would have stirred up the propellant in the part-used tanks. An early test flight had shown that it ought to be possible to rotate an S-IVB, but excessive motions of the stage had to be avoided in case large slosh waves were generated within the tanks. Unfortunately, Apollo 15's S-IVB managed to lose a quarter of a tonne of LOX when it readjusted its attitude too quickly. The stack had entered orbit in an excessive nose-down attitude and the slosh wave that resulted from the readjustment managed to reach a vent. Fortunately, the loss did not impact the mission. Diagram comparing inertial attitude and orbital rate attitude. control of pitch and yaw. It had no means to control roll, and, additionally, it was required to maintain its attitude during coasting flight. The engineers' solution was the auxiliary propulsion system (APS), two modules that were attached at the base of the stage's cylindrical section, each of which held four small rocket engines that burned hypergolic propellant from their own tanks. 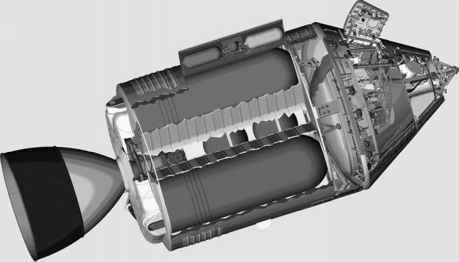 During powered flight, only the APS roll engines had to operate; and after the main engine shut down and the stage began to coast, the APS modules assumed control of all three axes: roll, pitch and yaw. 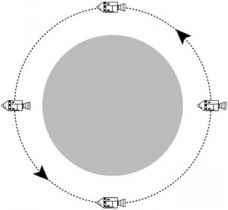 This method of flying around a planet or moon with one side constantly facing the surface required an orbital rate rotation to be set up. If it takes 90 minutes to orbit Earth (typical for a low Earth orbit), then by pitching down at a slow rotational speed that also takes 90 minutes per revolution, one side of the spacecraft can be made to face the ground at all times. This orbital rate attitude is obviously a useful technique for the many satellites that need to bring instruments to bear on a planet's surface. Conversely, if a spacecraft orbits a body but maintains its attitude with respect to the stars - for example, the Hubble Space Telescope - its attitude is said to be inertial and, as a result, it will continuously change the face it presents to the world below as it orbits. Apollo often used orbital rate motion during both Earth orbit and lunar orbit phases because so many operations required a ground-based frame of reference (pointing cameras, for example), and they became easier to understand and control that way. Monitoring an orbital rate rotation was a little problematic for a spacecraft that had been designed to show inertial attitudes. 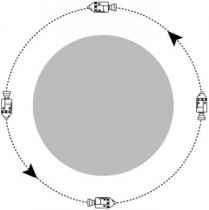 A way had to be found to make the 8-ball rotate at orbital speed so that it, too, would be displaying attitude with respect to the ground. The solution was one that reflected the hurried nature of the programme. There was not enough time within Kennedy's deadline to redesign the guidance system to implement such a feature. Instead, engineers added a workaround; a little box, given the acronym ORDEAL, that the crews had to install after they attained orbit. The acronym stood for orbital rate display, Earth and lunar, and its operation was simple. On the assumption that an orbital rate attitude was simply a slow pitch-down motion (which it would be if the S-IVB was oriented as planned), the ORDEAL supplied a calibrated drive signal that caused the 8-ball to pitch at the same speed. With this box properly set up, the crews could read off their attitude with respect to the ground. For later flights, they learned how to use the ORDEAL to monitor their attitude during the TLI burn, which was carried out in an orbital rate attitude. If it could be accurately monitored, the commander could take over control of the stack in the event of the S-IVB guidance system failing, thereby further increasing the redundancy of the entire Apollo system.